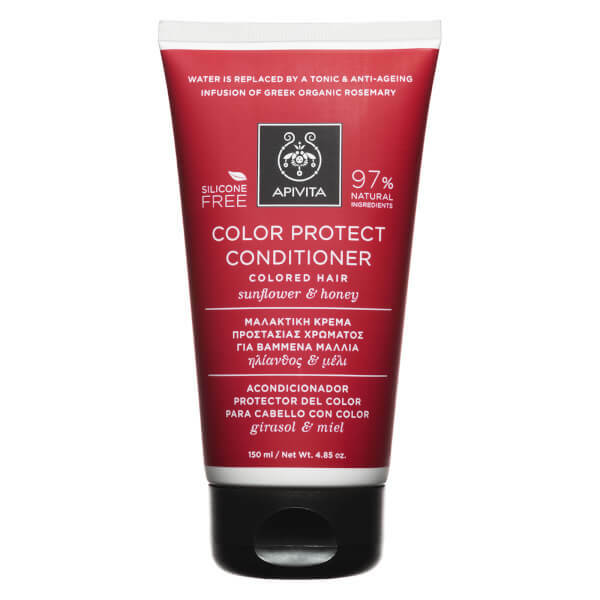 Restore vibrancy to your locks with APIVITA Holistic Hair Care Color Protect Conditioner for Colored Hair. The deeply moisturising formula envelops strands from root to tip, replenishing hydration whilst forming a protective veil against UV rays, pollution and heat styling to protect against colour fade. Infused with a nourishing blend of Sunflower, Honey and Vitamin E, the conditioner works to reconstruct damaged fibres, improving elasticity and manageability for a smoother, sleeker texture. Lavender and Jasmine essential oils stimulate the senses. 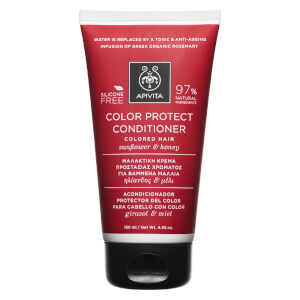 After use, hair will be bright, shiny and healthy. Free from parabens, silicones, mineral oil, propylene glycol and phthalates. Apply a small amount after shampooing. Rinse thoroughly. Avoid eye contact. For external use only. Aqua (Water)**, Cetyl Alcohol, Diheptyl Succinate, Capryloyl Glycerin/Sebacic Acid Copolymer, Glycerin, Brassicamidopropyl Dimethylamine, Cetyl Esters, Cetearyl Alcohol, Plukenetia Volubilis Seed Oil, Helianthus Annuus Hybrid Oil* (Helianthus Annuus (Sunflower) Seed Oil*), Mel (Honey), Aqua (Water), Helianthus Annuus (Sunflower) Seed Extract, Gossypium Herbaceum (Levant cotton) Flower Extract, Rosmarinus Officinalis (Rosemary) Leaf* Extract, Aspartic Acid, Panthenol, Olea Europaea (Olive) Fruit Oil*, Phytantriol, Alpha-Glucan Oligosaccharides, Aloe Barbadensis Leaf Juice Powder*, Arginine, Lavandula Angustifolia (Lavender) Oil*, Jasminum Officinale (Jasmine) Flower Extract, Hydroxyethylcellulose, Lactic Acid, Sodium Gluconate, Dehydroacetic Acid, Parfum (Fragrance), Benzyl Alcohol, Hexyl Cinnamal.